I have tried many cakes during my many years of baking, but when I come across a recipe I love, I stop looking. My Meyer lemon trees are heavily loaded with more lemons than I could possibly use. This cake covers my cravings for not only a great dessert but includes all the flavors from the zest to the juice from my Meyers. My dear friend Chef Candy Wallace introduced me to this recipe when we were serving a luncheon for the MS program at U.C.S.D. We had to serve a big crowd that day, and by the time we were through the cake was gone, and I didn’t even have a bite. Later that year, I asked Candy to teach an olive oil class and to please bake that cake for the students. And she did! It was a cake that I immediately added to my recipe files. And since my Meyer lemons are in season, I made it into an upside-cake adding a slightly more lemony taste. Tip: I do have three lemon trees in my backyard, two Myers and one Eureka. I do try and use them up, but many times I squeeze the lemons and freeze the juice for later. Add it to your sauces, dressings, pasta, or squeeze as a topping for your final step on your dish. The Meyer lemon is a hybrid citrus fruit native to China. It is a cross between a citron and a mandarin. It has a thin skin, with a sweeter juice taste. 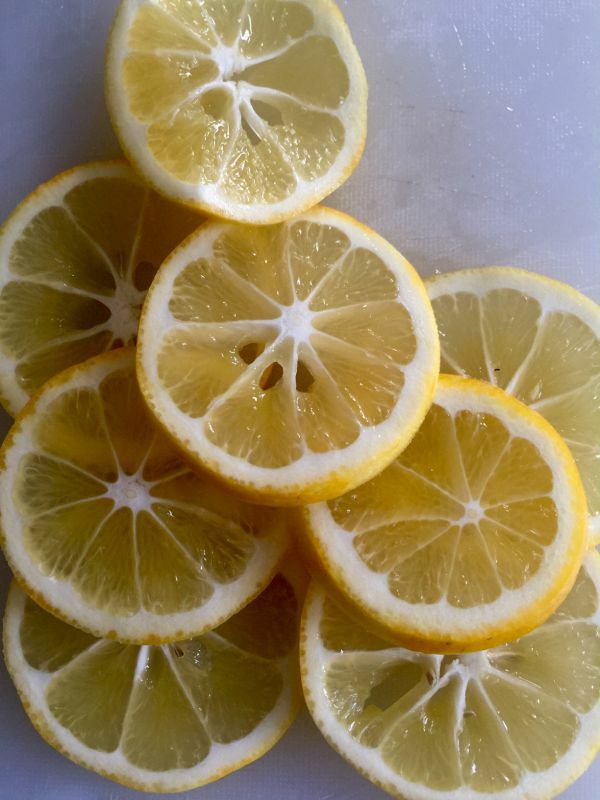 The Eureka lemon is a dwarf lemon with very big yields of ultra-acidic, golden-yellow fruit packed with flavorful juice. The tree produces twice a year with a thick-skin, producing a large juicy lemon. Tip: Thyme is a savory herb that is often used to flavor meat, seafood, and vegetable dishes. It is a member of the mint family and has been used for centuries dating back to the ancient Greeks and Egyptians. Sometimes I like a savory touch to my desserts. 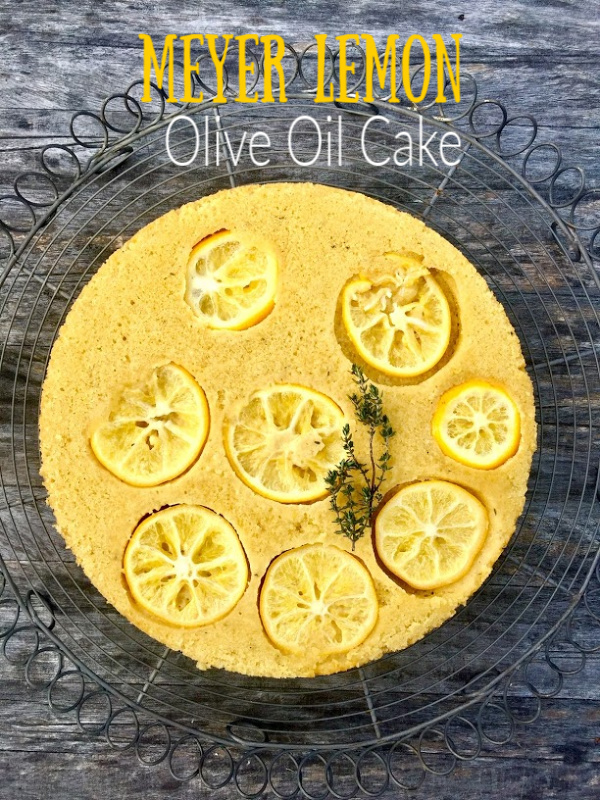 You can substitute rosemary in this cake recipe. This cake is more of a dense European style with freshly sliced Meyer Lemons for the top. I used fresh thyme for a more savory touch, or you can use fresh rosemary. Serve with a dollop of whipped cream or ice cream. Preheat the oven to 350 degrees and butter a 9-inch baking pan. Set aside. Combine the almond four, semolina, baking powder and sea salt in a medium bowl. Stir thoroughly to remove any lumps. Set aside. In another bowl combine the brown sugar, olive oil, juice and zest, eggs and thyme. Beat with a hand mixer or stand mixer until the mixer is lighter in color and well incorporated. Fold the wet ingredients into the semolina mixture until well incorporated. Arrange the lemon slices in the buttered pan, not overlapping the slices. Add the batter on top of the lemon slices. Smooth the top of the cake. Bake at 350 degrees for 30-35 minutes or until skewer inserted comes out clean. Leave the cake in the pan to cool for 5 minutes. Remove and cool the cake on a wire rack. When cooled you may add a dusting of powdered sugar, or serve with a dollop of whipping cream or vanilla ice cream.